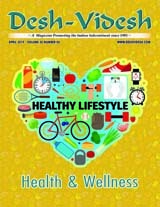 Can you believe Desh Videsh Media Group has been involved in the community for 25 years! What an exciting journey it has been. As I said before, this is just the beginning. At the 2017 Desh-Videsh Media Group Community Award Gala Banquet, I took a moment to thank all of our supporters. Once again, on behalf of Aruna, myself and the entire Desh-Videsh Media Group team, I thank each of you – our advertisers, readers and supporters, from the bottom of our hearts for taking this exciting journey with us. I hope you are not tired yet, because we plan to stay with you for a long time. In this issue, we share our 25-year journey with you. I point out major milestones we have crossed, and I outline what is to come. We hope you will continue to support us going forward as you have in the last 25 years. 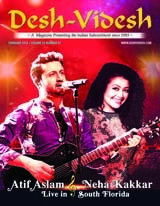 This issue, we are excited to share more about Atif Aslam and Neha Kakkar, who will perform live in South Florida. It is also our pleasure to welcome a partnership with Prakash Patel from Kash Production, who has achieved so much at a early age and is truly a down to earth person. We are also delighted to add a new section this issue, NRI News. We can never say enough about our fellow NRIs and their achievements. We’re excited about our upcoming Bridal Expos, be sure to visit us there! We’ll be in Atlanta on Sunday, March 25, at the Renaissance Atlanta Waverly Hotel. On April 15, we’ll be in Orlando at the Hilton Orlando. 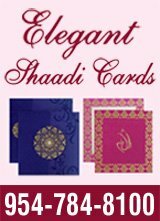 With a wide range of wedding and event vendors on hand under one roof, you’re sure to get a head start on your planning to-do lists! 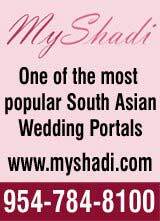 As always, parking and admission are free, so be sure to register online at www.myshadibridalexpo.com to attend.